General Tso's Chicken - fried boneless dark-meat chicken, served with vegetables and whole dried red peppers in a sweet-spicy sauce - is one the most common yet enigmatic dishes you will find on a Chinese menu. It makes you wonder: Who was General Tso? What was his association with chicken? Why in God's name is this dish (which even a culinary incompetent like me could probably make) listed as a "Chef's Specialty" on most menus? 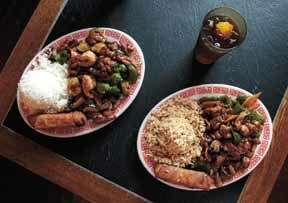 Note: The dish at the right is General Tso's Chicken. The dish at the left is Seafood with Broccoli in Hunan Sauce. Such are the perils of not photographing your own Chinese food. Wait, did I get it backwards? No, I see a shrimp on the plate to the left. If you read the biography below (written by a military historian who believes in very, very long sentences), you'll notice that while Tso was a successful 19th C. Chinese general, chicken is not mentioned even once. It's pretty clear that General Tso didn't have the time to invent or even taste the dish named after him. So where did it come from? My theory: It was invented in the mid-1970's, in NYC, by one Chef Peng. Chinese food in New York was different in the early '70s; while there were a quite a few Chinese restaurants around, they were all Cantonese. Bland food, served in a decor straight out of the 1950's (think: Too much RED). Around 1974, Hunan and Szechuan food were introduced to the city, and General Tso's Chicken was an exemplar of the new style. Peng's, on East 44th Street, was the first restaurant in NYC to serve it, and since the dish (and cuisine) were new, Chef Peng was able to make it a House Specialty, in spite of its commonplace ingredients. Now, of course, the Szechuan/Hunan style has almost completely taken over New York City Chinese food (you can still find Cantonese food, but you have to really try). General Tso's Chicken is still a house specialty (since every Chinese restaurant, even the $4.99 Lunch Special places, copied Peng's menu), and the staff still laughs behind your back every time you eat one of the hot peppers by accident. You knew they did that, didn't you? Those whole dried peppers HAVE to be there as a practical joke, since they don't really make the dish spicy - unless you eat one, in which case you'll breathe fire for the next 20 minutes. The original recipe used a fairly spicy sauce, but most of the time the modern version is pretty bland, giving you the choice of not enough spice, or too much. What else would you expect from someone who named a dish after a general best known for fighting his battles while suffering from dysentery? Quite a few people have put General Tso's Chicken recipes on the Web, so if you don't like the one below, there are plenty of others to try. Do an Excite search on "General Tso" and see what happens. If you live in or near Park Slope (a neighborhood in Brooklyn with the highest per capita number of bad Chinese restaurants in the entire world), visit Josh Karpf's General Tso's Chicken Survey. I must thank Josh for getting me thinking about the weirdness of General Tso's Chicken as a House Specialty. I then recalled where I had eaten Hunan food as a teenager, paid a visit to the Strand, and the rest is history. The question everyone asks: "Who was General Tso, anyway?" Admit it. Sooner or later, while eating your Chinese take-out, you asked yourself "Who was this guy, and why did someone name this ubiquitous yet mediocre chicken dish after him?" If you're like me, it was one of those questions that lurked in the back of your mind for years, vaguely annoying you (but not so much that you would actually go and find the answer). After wondering about this since the mid-70's, I finally consulted The Harper Encyclopedia of Military Biography (Trevor N. Dupuy; Castle Books, 1995, $65 but you can get it at The Strand for $17.95 if you live in NYC), and solved the mystery. TSO T'sung-t'ang (1812-1885). Chinese statesman and general. Principal wars: Taiping Rebellion (1850-1864); Nien Rebellion (1851-1868); Muslim Rebellion (1867-1873); conquest of Sinkiang (1874-1878). Born in Hunan to a gentry family (1812); received a classical Confucian education and gained his doctoral degree (c. 1840); embarked on a successful career as a scholar-administrator, he was sent to join Tseng Kuo-fan's Hunan army to fight against the Taipings (1853); a general by 1860, he was given a semi-independent command, and enjoyed considerable success; appointed governor of Chekiang province, then largely in Taiping control, he was charged with restoring it to Imperial rule (1862); he set about his task with energy and efficiency, and soon drove out the Taiping (1864); in the meantime, he had been appointed viceroy of Chekiang and Fukien provinces (1863); he founded a modern arsenal and dockyard at Foochow; ennobled as a marquis (1866); appointed viceroy of Shensi and Kansu provinces in northwest China (1867) and ordered to suppress the Muslim rebels in those areas; before he could begin this task, he was sent to help in final operations against the Nien rebels (1867 - August 1868); he organized local forces as his mentor Tsung Kuo-fan had done in Hunan (autumn 1868); creating an efficient system of logistical support, he moved against the Muslim rebels and suppressed them in five years of vigorous activity (1868-1873); the successful conclusion of these operations left his troops near Sinkiang, occupied by rebellious Turkic tribes; a bitter debate ensued in the government between the supporters of Li Hung-chang, who favored creation of a modern navy and a maritime policy, and the supporters of Tso, who favored the recovery of Sinkiang and the expulsion of the Russians from the Ili Valley; Tso's allies won (April 1875); after considerable planning he launched his offensive (March 1876); often operating as far as three months' march from his nearest base, he subdued the Turkic tribesmen, defeated their leader, Yakub Beg (May 1877), and reestablished Chinese control of Sinkiang as far as the Ili (1878); this success enabled the Chinese to negotiate the recovery of most of the valley (1881); appointed governor-general of Liang Kiang (1882); during the Sino-French War (1883-1885) he was appointed a grand secretary of state (1884); died in Foochow (September 5, 1885). An intelligent and able scholar-administrator, Tso was particularly gifted as a logistical planner; his long-distance campaigns in northwest China and Sinkiang compare favorably with contemporary operations of European armies; equally remarkable was his unusual stamina, for most of these operations were carried out while he suffered from recurring bouts of malaria and dysentery; with Li Hung-chang and Tseng, a founding member of the Self-Strengthening Movement. Bone the chicken legs, including the thighs by scraping the meat from the bone, working downward and keeping close to the bone. Pull the meat down over the bone (pulling it inside out like a glove) and cut it free from the bone. Discard the skin and cut the meat from each leg into 6 pieces. In a bowl combine the soy sauce, vinegar, 1/2 c water, the garlic and ginger root. In another bowl, combine the egg and cornstarch and dip the chicken pieces. Heat the oil in a wok or deep, heavy skillet until very hot, add the chicken and fry it for 4 to 6 minutes, or until it is crisp. Transfer the chicken with tongs to paper towels to drain and pour off all but 1 T of the oil from the wok. Add the soy sauce mixture, the chili peppers and the chicken and cook the mixture over moderately high heat for 2 minutes, or until heated through. Transfer it to a heated serving dish. Serves 4. Thanks to Wentzel ISP's recipe database for the recipe! You might try some chili paste in the sauce if you want this to be spicy, but don't want to eat whole chili peppers. There is no reason why you couldn't save a little time by using boneless chicken thighs. It is common these days for General Tso's Chicken to be served with a garnish of steamed broccoli, or with green and red peppers, baby corn ears, or other vegetables included. If you're going to use vegetables, steam them separately and add them when you combine the chicken, peppers, and sauce. If you don't like chicken, you can substitute anything that can be cut up in small, boneless pieces and deep-fried in a light egg/cornstarch batter. You will occasionally see General Tso's Shrimp, or General Tso's Beef on menus, and can make them yourself in the obvious way. Be creative. The world is just waiting for someone to make General Tso's Kangaroo, or General Tso's Squirrel. The entire contents of this page, with the exceptions of the recipe and General Tso's biography, are (c) 1997 Eric A. Hochman. If you have any comments on this page, the recipe, or you succeed in making a plate of General Tso's Kangaroo, email me.